Topps Tiles plc, the UK's leading tile retailer, wanted to gain a better understanding of what, in the eyes of their customers, differentiates their products from those of their competitors and therefore leads them to choosing Topps Tiles products. 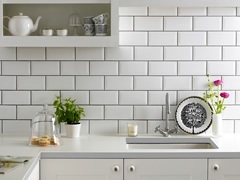 Topps Tiles asked Lucideon (which was at the time called Ceram) to carry out a benchmarking study of one of their current best-selling products, the Metro White tile, against competitors' versions in terms of visual and physical characteristics. Our team of materials experts developed a methodology to compare the Metro White tile and competitors' versions against twenty two characteristics, characteristics that customers are likely to consider and base their decisions on in-store. Weight, visual characteristics and colour were determined and assessed and a ranking system developed. Using the ranking system, it has been possible to differentiate the Topps Metro White tile as being superior to competitors’ in terms of visual quality, according to what the customer is likely to perceive when viewing products in store. The Topps Metro White tile will appear free from surface defects and contamination, whiter, of uniform dispersion, flat, glossy and with a high level of overall finish compared to those of its competitors. Topps Tiles is now able to use the study to differentiate its product in the marketplace and to use as a basis for customer feedback in store.